Our hunt is taking place at the bleeding edge of the Alaska / British Columbia border - near a little town called Hyder, Alaska. With a population of 60, the town is nicknamed the "friendliest Ghost town in Alaska" and is accessible only by boat, or by highway through Stewart, British Columbia. Nestled at the headwaters of the Portland Canal, the town is rich in history. The town of Hyder began as a mining town, but after the mines shut down, so did the town. Today, there are two main industries in Hyder; fishing, and tourism. The town is home to a salmon run that attracts both brown bears and black bears. What makes this run unique, is that the run is right off the road, and that brings in lots of tourists hoping to catch a glimpse of the bears. It took a couple days for me to get here. I had to fly from Boston to Vancouver, then Vancouver to Smithers, British Columbia. We overnighted in Smithers, and the next day drove six hours to Hyder. By the time we reached Hyder, it was too late to hunt. So Johnnie and I drove up the salmon river and up to check the water level to the creek where we would be hunting. So we are actually starting our hunt on Day 3 of my trip. 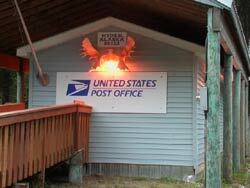 It's good to be back in Alaska. This is my eighth bowhunting trip here. My fourth with Johnnie Laird of Muskeg Excursions and my 3rd time for brown/grizzly bears. After chores, Johnnie and I hit our first creek to see if we could find salmon. There are several types of salmon that spawn in these rivers and creeks, including a late fish run in October. It was that run that we were banking on. Indications next to the road, looked poor - far past peak. But, as we waded the milky-blue glacier fed river, we kicked a couple COHO (silver salmon) upstream. This was a good sign. 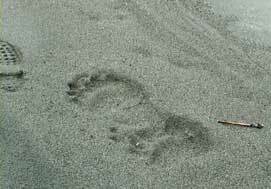 We found some fresh brown bear tracks, and lots of fresh wolf tracks. The trip up the creek was uneventful and relatively easy - compared to my other trips in the Southeast. 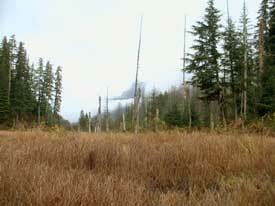 Our goal was a small beaver swamp which we reached in about ninety minutes. The swamp contained clear pools which contained a few dying COHO. There was a decent amount of bear sign, but it appeared to be made by bears who were meandering, not the active and consistent sign we hoped for. We'll keep this area in our back pocket for later. We hiked back out of the creek and headed home. We have a small log cabin we're staying in, complete with a wood stove, electricity and clean dry beds. Unlike last year's trip, this one may actually be comfortable. 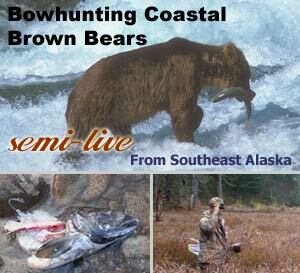 Our grizzly hunt takes place in Southeast Alaska with Johnnie Laird of Muskeg Excursions.